Habitat: Upland, Mountain. 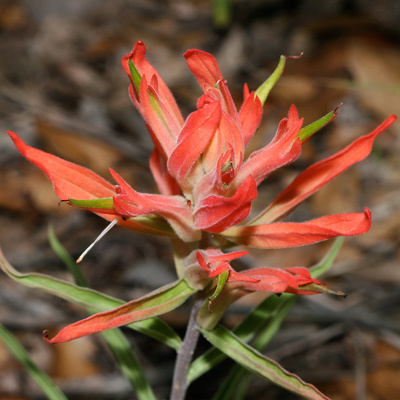 This wildflower grows in oak and pine woodlands in the mountains at elevations from 3000 to 7500 feet (900 to 2300 m). Description: The mostly green, exserted, beak-like floral tubes are surrounded by hairy, red, orange, or yellow, petal-like bracts that are either entire (not toothed or lobed) or shallowly cleft at the tip with erect, pointed teeth. The flowers are followed by egg-shaped seed capsules. The leaves are green and hairless or almost hairless above, paler green and densely covered with woolly, matted hairs below, alternate, simple (undivided), entire, and linear in shape with curled-up margins. The usually multiple stems are stout, often woody at the base, and covered with appressed, matted, woolly, grayish white hairs. The plants are partial root parasites of nearby plants. 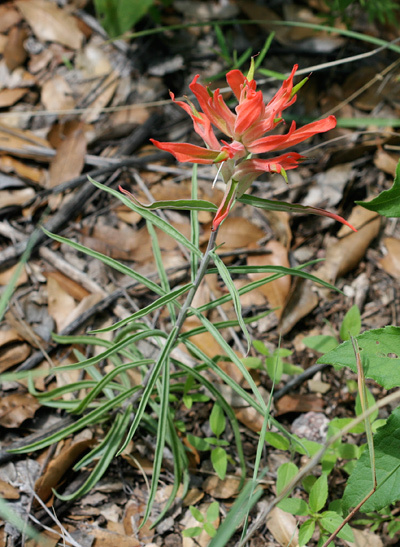 The similar Rincon Mountain Indian Paintbrush (Castilleja austromontana), Wyoming Indian Paintbrush (C. linariifolia), Lesser Indian Paintbrush (C. minor), Trans-Pecos Indian Paintbrush (C. nervata), Huachuca Mountain Indian Paintbrush (C. patriotica), and Santa Catalina Indian Paintbrush (C. tenuiflora) do not have stems covered with white-woolly, appressed, matted hairs. Sierra Woolly Indian Paintbrush (C. lanata) does also have woolly stems, but its leaves are hairy both above and below and its upper leaves and floral bracts are deeply cleft.